If you’re like me—and I bet you are because you are actually reading this—you like to be on the cutting edge of honest news and accurate information. You like to hear about the latest financial trends and know what’s happening around the world and right here in the United States that could directly impact your life and the life of your family. You don’t rely on the mainstream for this information because, frankly, it can’t be trusted—and you know that. “Newspapers,” one wise sage once said, “are not in business to give you the news, but to make a profit.” How true it was, and how true it is. All of what you see on the television, read in establishment publications, hear on the radio and read on conformist Internet sites is slanted to mold public opinion—your opinion. And, of course, to make profits for their owners. In short—and you’re smart enough to realize this—the mainstream media is in the propaganda-for-profit business. But there is an alternative news outlet with a long-established track record for honesty and integrity—American Free Press (AFP). AFP is the preeminent alternative, independent news source for honest, hardworking, truth-loving Americans. AFP is the antithesis of the controlled mainstream press. AFP is employee owned and has been so since its founding. We never have and never will allow advertisers or special interests to dictate what appears in the pages of AFP, which is one of the reasons why we have been shunned by our establishment “competition” and vilified by the high-level crooks we’ve skewered since our founding in 2001. Twenty-six times a year American Free Press newspaper is delivered to your door packed with the kind of uncensored news I know you will appreciate and filled with facts you can profit from in many ways. AFP covers the stories and tells the truths that the mainstream is, frankly, scared to touch. From the real cause of Middle East strife to the common sense solutions to our money problems here at home to the real-life conspiracies of politics and government, AFP offers real, on-the-scene reporting and commentary the likes of which you will never see in The Washington Post, The New York Times, ABC, NBC, CBS, CNN and just about any other mainstream news source you can name. And while the mainstream presents news straight from the cookie-cutter factory (nearly every news broadcast you watch, for instance, is indistinguishable from another), AFP has thrown away that hackneyed mold and refuses to follow the lead of the Big Media. That’s right—there’s one and only one national populist newsweekly staffed by an unsurpassed team of veteran investigative journalists who’ve dared to rip the veil off many major news stories that have been censored and suppressed by the big money-controlled media monopoly. That’s AFP. AFP publishes exciting in-depth, uncensored news and information that grassroots patriotic Americans need to know in order to combat the growing police state. AFP stands firmly against the New World Order conspirators with names like Rockefeller and Rothschild who are working to establish a “Global Plantation” under the rule of a powerful few. AFP is YOUR voice. If you have any doubt about why “they” want to silence AFP, you must be relying on the mainstream media for your “news”—and that’s a big mistake! That’s why American Free Press exists: to counter the ever-tightening Media Monopoly both here in the U.S.—and around the globe. Subscribe today and find out the news that you need to know. One year of weekly issues of American Free Press is $59—weekly issues delivered right to your doorstep. Two years of weekly issues of American Free Press are just $99. If you’d like a trial subscription or if you’d like to send a gift to a friend, try our 16-week trial subscription to AFP for just $17.76. Our digital version is just $15. Every week you get a digital version of the newspaper in PDF format you can open right on your computer. Full color and about three megabytes, each issue can be opened in Adobe Acrobat®. 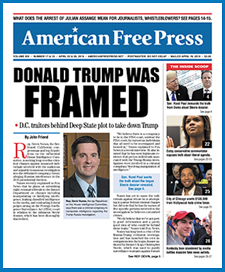 OUR GUARANTEE: If you are ever dissatisfied with your subscription to American Free Press, just drop us a note and we’ll gladly refund the unused portion of your subscription.